India’s largest crowdfunding site. Over Rs.548.4 Crores raised. Ashwamedh Foundation was founded on 1st August 2012, It got registered as Charitable Society and Public Trust in 2013. We are working in Child Education and Development sector. Ashwamedh Foundation completed 4 audits till now and have successfully created it’s flagship projects like Ankur and Aakar. You can visit our website www.ashwamedhfoundation.org for further details. Ashwamedh Foundation do not have it’s owned centre. We work with many vernacular schools and NGOs. We have also carried out several health camps, awareness activities in leading hospitals and colleges of Mumbai. We helped Kashmir Flood victims, Nepal Earthquake victims and Chennai flood victims by sending collected Clothes, rescue materials etc. Project Ankur by Ashwamedh Foundation focuses on 'early development of Students. We have noticed that due to Govt. 's rule of passing every students till 8th Std. without any year-drop has deteriorated the level of Education. There are many students who don't even know how to read and write when they enter in 9th Standard. This is completely shocking. Hence Project Ankur catches students at early standards like 5th, 6th and 7th and develop them properly. We teach them Reading, Writing, Basic Maths, English and General Academic related things which they should learn at basic age. 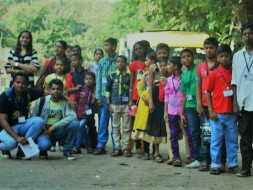 Donors can visit our website www.ashwamedhfoundation.org and themselves see our work and results there. Please do like our Facebook Page /ashwamedhfoundationtrust and follow us on Twitter @AshwamedhF.